It all starts the same way. “I want to go auto-crossing!” you say. So, you start browsing the interwebs and research the S2000. You start auto-crossing and start modding and moving through the classes. Then, you do a track day. Then, you mod the car some more. Then, you do time attack. 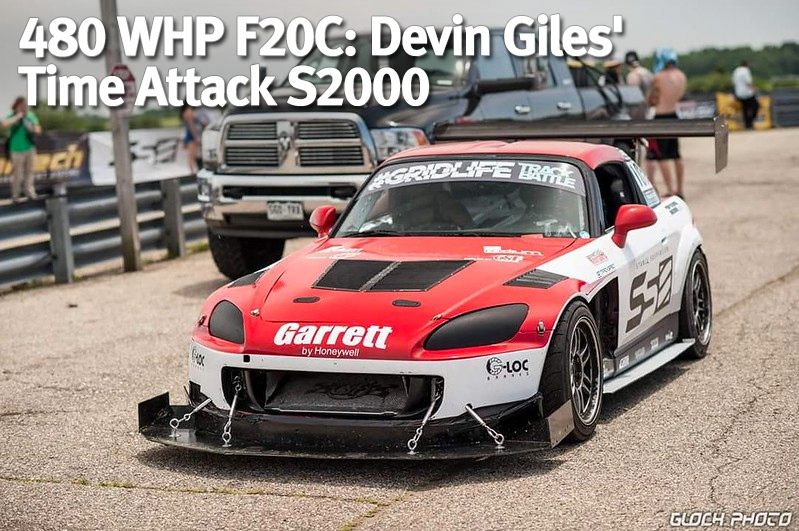 Then, you end up with a highly built race car like Devin Giles- owner and driver of this fast S2000. It’s a familiar path; there’s probably a support group for it out there. Devin’s car had made it to pretty-fast stage with mostly bolt-on mods. But, he wanted to go faster, of course, and that required more power. So, a Honeywell Garrett turbo was employed. With power out of the way, the car was lacking grip. At this point, Professional Awesome was called in to come up with some aero solutions that Devin could build. Professional Awesome provided the splitter design that was easy to fabricate. It features a nice vertical surface to build up the stagnation pressure, end plates to control the airflow at the ends of the splitter, and diffusers to reduce the pressure underneath. The eyehooks provide attachment points to make sure all the downforce created by the splitter is transferred to the chassis. The rear aero setup was also under the guidance of Professional Awesome. The Kognition rear wing uses KazeSpec mounts to tie straight down to the chassis; no one wants a trunk mounted wing that can fail, as the end result is usually pretty bad. The deck lid rear spoiler with Gurney flap works in conjunction with the rear wing. Turbo S2000s that are tracked on road courses often have overheating issues with the traditional stacked intercooler/radiator setup due to the lack of frontal opening area. A solution is to go with a V-mount setup. A CSF radiator is placed down low and the Garrett intercooler forms the upper half of the V. The radiator and intercooler have shrouds to force all the air through the two heat exchangers.